Sad that the Seattle Jazz Showcase is winding down? How about checking out the Columbia City Beatwalk? The BeatWalk is a monthly, community music event, which takes place on the first Friday of each month in the Columbia City neighborhood. For one low cover price of $5.00, you can stroll around and hear/see live music in 7 different venues! That’s a lot of musical bang for your buck. Venues include a book store, a health club, an art gallery and several bars and restaurants. There is a variety of programming and there are always at least a couple of jazz acts. This Friday, the Garfield Jazz Quintet will be playing at Bookworm Exchange. This is one swinging, little group, and these teenage musicians already have some fierce chops going on. If gypsy jazz is more your thing, the Djangomatics are playing at Lottie’s Lounge. The BeatWalk takes place this coming Friday, November 2 from 7-10pm. For more information and the complete line-up, visit www.columbiacitybeatwalk.org. Seattle’s African show of the year. The Tuareg rebel band, Tinariwen, lately a huge hit in Europe (and Rolling Stones opener), rides in with riffing, electrified Saharan fervor that resounds with the roots of American blues. Also unearthing blues roots with his high-powered band is Malian singer/guitarist Vieux Farka Touré, son of guitar legend Ali. Halloween in the embrace of 60s soul jazz: Seattle-based tear-it-ups Skerik (saxes), Joe Doria (Hammond organ), Andy Coe (guitar), and D’Vonne Lewis (drums). The acclaimed New York saxophonist, at the helm of the ambitious quartet Meta-Four, shows why he has been called on by trumpeter Dave Douglas, World Saxophone Quartet, and rockers Vernon Reid and Ben Harper. The young disciples of the Garfield High School jazz band amply backed up old master Houston Person Saturday night for two sets at the Triple Door. While experience carried the night, it was youth that stole the show. Pianist Lynne Arriale led her trio on opening night at Centrum’s Jazz Port Townsend. The concert was recorded last July atThe Upstage in Port Townsend and highlights will air on Jazz Northwest on KPLU 88-5 on Sunday November 4 at 1PM PST. Lynne Arriale was well on her way to becoming a concert pianist when she discovered jazz and brought her considerable ability to jazz. She won the Great American Piano Competition in 1993 and was subsequently invited to join nine other pianists on the 100 Golden Fingers tour of Japan (including legendary pianists Hank Jones, Tommy Flanagan, Kenny Barron among others). Since forming her own trio, Lynne Arriale has recorded ten CDs, made have many national “best of” lists and received frequent airplay on many jazz radio programs in the US and abroad. She’s as well-known in Europe and Japan and she is in the US. This program will also be available as a podcast at also be available as a podcast at www.kplu.org after the broadcast date. Jazz Northwest is recorded and produced by Jim Wilke exclusively for KPLU and is made possible by the Boeing Company. Gene Bertoncini is one of the most eloquent and versatile masters of the unaccompanied acoustic jazz guitar. His command of the instrument is intimate and powerful. He weaves soft, seductive jazz arrangements that cherish the melodies and harmonies of great songs. Part of the 2007 Earshot Jazz Festival. Spend your Halloween night with Joe Doria and McTuff at the Tractor Tavern. And where better to do this than the Tractor Tavern? And when, if not Halloween night? Tonight’s Seattle Jazz Showcase performance features two relatively new Seattle jazz groups, both of which have been creating a buzz lately. Jazz writer Jeff Levenson conducts an oral-history interview of Lorraine Gordon, owner of NY’s fabled Village Vanguard, open to the public. 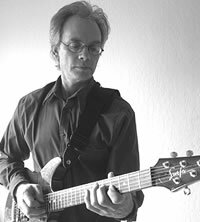 New York bassist Michael Bates’s growing boldness as a composer earmarks 2007 as a banner year. This Vancouver International Jazz Festival standout plays at the crossroads of structural experimentation and indisputable charisma. Michael Bates, double bass, Russ Johnson, trumpet, Quinsin Nachoff, saxophone/clarinet, Jeff Davis, drums. The Whidbey Island-based superbassist set out with Cecil Taylor, then sailed on to redraw the boundaries of bluegrass. He releases his new CD, which barely cages an untamed jazz and string-band menagerie. Week three of the Seattle Jazz Showcase starts tonight. A night of reverential mayhem: Sunship, inimitable experimenters fortified by sound alchemist Stuart Dempster, plus two more Seattle innovators, drummer Gregg Keplinger and electric guitarist Rick Mandyck. Jazz-historian pianist Thompson has enjoyed four decades of renown in a panoply of settings, including as a regular on A Prairie Home Companion. He joins the Puget Sound Traditional Jazz Society and Seattle trad specialists Holo Trad Jazz in varied combos at Ballard Elks, and brings his trio to Tula’s. For half a century, from his playing on Coltrane’s seminal Giant Steps to stints with Lee Morgan, the Jazz Messengers, and beyond, pianist Cedar Walton has crafted a gorgeous and peerless urban idiom. Few trumpeters inspire as much excitement as this richly melodic Pat Metheny sideman and recent add to the UW jazz faculty. He premieres Earshot-commissioned work for his heralded trio with drummer Ted Poor and remarkable bassist Stomu Takeishi. Gallery 1412 presents guitarist Bill Horvitz on Sunday, October 28th at 8:00pm. Bill Horvitz will be peforming with his group featuring Steve Adams on saxophones and flutes and drummer Paul Kikuchi. For the opening set, Bill will be joined by brother Wayne Horvitz on piano, keyboards, and electronics. Bill Horvitz has collaborated with many of new music’s most recognized innovators, including Elliott Sharp, John Zorn, Bobby Previte, Butch Morris, Myra Melford, George Lewis, Bill Laswell and Frank London. The Bill Horvitz Band moves with fluid grace between tight compositions and improvised solo and ensemble work, communicating with a telepathic rapport. Wayne Horvitz is a seattle-based composer, pianist and electronic musician. He is the leader of Zony Mash, Pigpen, The Four plus One Ensemble and co-founder of the New York Composers Orchestra. He has performed and collaborated with Bill Frisell, Butch Morris, John Zorn, Robin Holcomb, Fred Frith, Julian Priester, Philip Wilson, Michael Shrieve and Carla Bley among others. He has been commissioned by the NEA, Meet The Composer, Kronos Quartet, Seattle Chamber Players, Mary Flagler, BAM, Earshot Jazz and others. Pilc, a former French rocket scientist, constructs dazzling piano work of dense harmonics, speed-of-sound technical facility, and otherworldly propulsion. On afterburners: bassist Thomas Bramerie and stunning drummer Ari Hoenig. The Garfield band, local-favorite past Essentially Ellington winner, renews its summer Centrum-workshop collaboration with revered tenor saxophonist Houston Person, once an Etta Jones mainstay and long treasured in his own right. Musafir (Hindi and Urdu for “traveler”) plays the music of the Rajasthan desert of North India, the “gypsy homeland” of the Roma. They create a transcendent blend of music, dance, and performance art. Advance $22 ($19 discount), door $25 ($22 discount). >> Note correction to brochure: Ballard Elks show is on Sunday Oct 28. The PONCHO Concert Hall was very close to sold-out for this concert. As part of his introduction, Earshot Jazz Executive Director John Gilbreath mentioned the unusual and appreciated pre-concert publicity in the Seattle Post-Intelligencer. Dawn Clement opened her segment of the program solo with a uniquely structured piano-vocal interpretation of the standard “All of Me.” A traditional hymn served as the piece’s intro in a pensive, fragile and seamless blend. She sings with excellent enunciation and distinctive phrasing although she really doesn’t have a lot of strength in her voice. There’s certainly plenty of emotion though. Billie Holiday – for one – didn’t have a great natural instrument either. It’s about communication and feeling not about chops. This low-key performance was marred a little by the snare on the drum-kit rattling a bit, but that was only a minor annoyance. She spoke briefly about her recent busy schedule in the recording studio. New CDs with soprano saxophonist Jane Ira Bloom, a trio (Matt Wilson and Martin Wind) and another – her second – with Seattle area jazz icon Julian Priester are ready to be released soon. Kudos to the Seattle PI for their coverage of the Earshot Jazz Festival … a Seattle daily newspaper actually publishes a jazz review! Let’s hope there is more coming soon. Two duos brought different listening experiences to the Chapel on Monday night. Reuben Radding (bass) and Jane Rigler (flute) were like funambulists who created their own falls and recoveries. Radding, the more dangerous player, was balanced by Rigler’s classical poise. Trevor Watts (saxophone) and Jamie Harris (percussion) blended free jazz with traditional African rhythms, a combination that wasn’t entirely successful in the duo format. One could imagine a martial-arts duel choreographed to the musical exchanges between Radding and Rigler. The opening piece was a short round of sparring jabs, with Rigler thrusting syncopated blasts of wind into Radding’s off-kilter balancing act. She switched to piccolo for the next piece, playing flurries of notes without giving any of them a conventional tone, while Radding scraped his bow against the face of his instrument before the resolution of a low, bowed note that sounded like a distant foghorn. Two Origin Records titles have been the All About Jazz Downloads of the Day recently. Today you can download a track from Portland’s Upper Left Trio‘s new CD, Three, and yesterday featured Chicago’s Deep Blue Organ Trio‘s new CD. Click here to download the free tracks. John Hollenbeck holds a free presentation today at Noon at Cornish College (206-726-5151) which is open to the public. French pianist Jacky Terrasson has charmed audiences on both sides of the Atlantic. His new album, a musical self-portrait called Mirror, furthers the growing legend. Appearing with his group, Chicago native Vasandani is an emerging jazz vocalist whose remarkable presence and extreme elasticity of phrasing hold great promise. Solo or in large-ensemble soundscapes, Hollenbeck wields percussion like a shrewd lyrical poet. Ace organist Gary Versace and vocalist Theo Bleckman join the can’t-miss, boundary-bashing Guggenheim Fellow. The Israeli clarinetist and tenor saxophonist recently finished her first residency at the Village Vanguard, where she was the first female horn player to headline the famous club. Cohen, one of the most visible members of a growing community of Israeli jazz musicians working in New York, has won a number of recent honors, among them “rising star” in the clarinet category in Downbeat’s annual critics poll (August issue). Be sure and catch local pianist Bill Anschell and his trio performing live at noon in downtown Seattle. Joining Anschell will be Doug Miller on bass and Jose Martinez on drums.